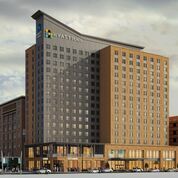 CHICAGO – (April 2, 2019) – Hyatt and HRI Properties, LLC (HRIP) officially opened Hyatt Place and Hyatt House hotels in the Wholesale District of Indianapolis. Developed and constructed by HRI Properties, the dual-branded property represents a prominent landmark within central downtown and creates an experience that enables guests to enjoy both brands under one roof. Hyatt Place hotels combine style, innovation and 24/7 convenience to create a seamless stay with modern comforts. There are more than 330 Hyatt Place locations in Armenia, Australia, Brazil, Canada, Chile, China, Costa Rica, Germany, Honduras, India, Mexico, Morocco, Nicaragua, Panama, Puerto Rico, Thailand, The Netherlands, United Arab Emirates, United Kingdom, and the United States. For more information, please visit hyattplace.com. Join the conversation on Facebook and Instagram, and tag photos with #HyattPlace and #WhySettle. The Hyatt House brand launched in 2012 and offers more than 90 locations throughout the United States, China, Germany, Mexico, Turkey, and Puerto Rico. Inspired by extensive research into guest experiences, Hyatt House hotels offer services, amenities, upscale spaces and a casual, comfortable environment that reminds guests of home. For more information, please visit hyatthouse.com. Join the conversation on Facebook or Instagram and tag photos with #HyattHouse and #WhySettle. HRI Properties, LLC ("HRIP") is an internally managed, fully integrated owner, operator and developer of premium branded hotels and upscale apartments in top urban U.S. markets. Since 1982, HRIP and its predecessor have completed more than 90 projects involving more than $2.9 billion of total invested capital, which include over 6,600 apartment units, over 6,700 hotel rooms, and more than 1.45 million square feet of office and retail space. HRIP is a full-service real estate development company, with in-house architectural design and construction management capabilities and is a national leader in the adaptive reuse of historic structures. As the urbanization trend in the U.S. continues, we are committed to Elevating the Urban Experience by developing, acquiring and managing high quality real estate located within "walkable" urban neighborhoods where people want to live, work and play. For more information, please visit our website at www.hriproperties.com.